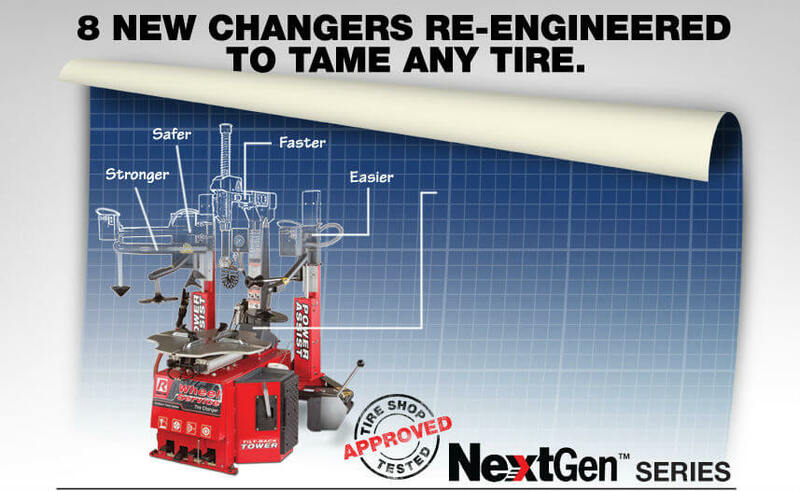 Forget everything you thought you knew about tire changing and meet NextGen™, the all new high performance series of tire changers by Ranger. We went back to the drafting table and re-engineered every NextGen™ changer from the ground up, making them the fastest, strongest and most gentle way to tame your toughest tire jobs including run-flats and low-pros on fragile alloy wheels. Scroll down to discover why a NextGen™ tire machine is more than just another tire changer -- it's a game changer. NextGen™ tire changers feature high-torque electric turntable drives. 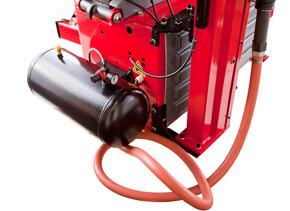 Increased speed and reversible direction for quicker tire removal and installation. 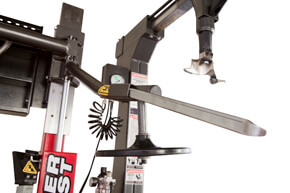 The NextGen tire changer's geometric tabletop provides easy bead lubrication and allows operators to make visual inspections of the lower bead during mounting and inflation procedures. 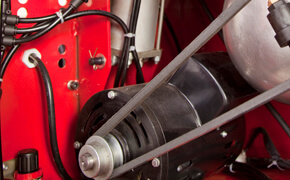 An improved electric motor features rugged copper rotor construction, stronger high-quality ball bearings, thermal-cool epoxy insulation, and durable rolled steel frame comes standard with each of the NextGen tire machines. 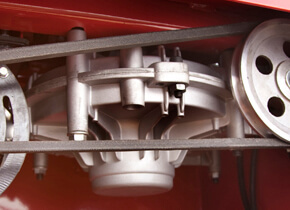 A balanced flywheel helps each tire changing machine run smoothly, reduces vibration, and helps minimize stress on machinery components. Newly designed, maintenance-free gearbox comes standard on all NextGen tire changers and features large oil and grease reservoir which provides efficient heat dissipation and improved lubrication for longer service life. NextGen tyre changers feature a robust pneumatic accelerator for lightning fast bead-breaker speeds in both directions. 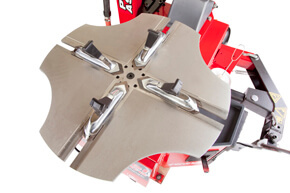 A multi-axis, adjustable bead breaker blade can be found on each NextGen tire changer to provide multi-angle tire capacity settings to help accommodate a larger variety of tire and wheel combinations. 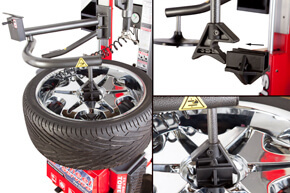 TurboBlast™ bead seating system on your new NextGen™ tire changer is capable of blasting a powerful air burst between the tire and rim to help seat stubborn beads fast. The NextGen TurboBlast bead seating system features a durable, non-marring nylon discharge barrel features a contoured tab that locks securely on the edge of the rim for better control during air discharge between the tire and wheel. 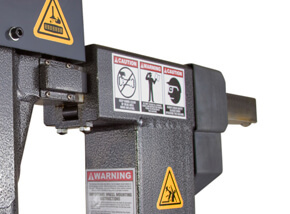 The NextGen bead breaker arm features rugged box frame construction that increases the mechanical strength and assures years of dependable service and performance. Large, dual-flange NextGentire machine bead breaker axle eliminates blade flex and premature failure. A 100% stainless-steel NextGen bead breaker cylinder means no more worrying about moisture contamination from corrosion due to air source condensation on your tire changer. All NextGen tire changers feature industrial-grade, 45-micron, pneumatic control valves feature die cast and machined bodies constructed from zinc and aluminum. 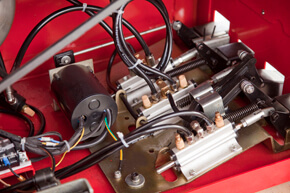 Rebuildable, pneumatic control valves feature high performance polyurethane seals and self-lubricating, Teflon piston guides that provide increased service life and performance at the highest level possible within almost every imaginable working condition with your new NextGen tire changer. 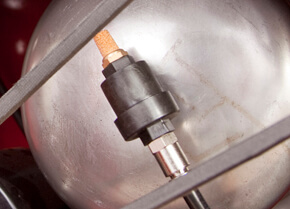 Valve plungers feature muffled extrication ports that direct any dirt or contamination accumulated on the outside perimeter of the spool to be automatically blown away each time the valve goes into the release position. 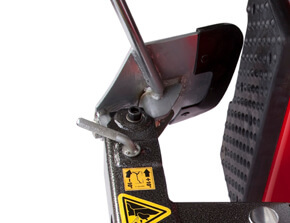 NextGen tire changers feature durable forged steel (instead of aluminum) foot pedal levers will stand up to everyday use and abuse in high-volume tire centers. 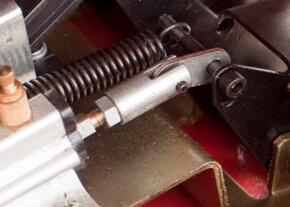 Snap action spring return means precise and controlled operation. 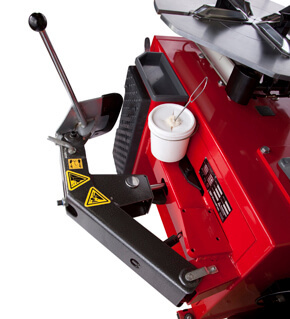 Up-front controls and a sensible ergonomic design provide ease of use and more efficient operation with your NextGen tire machine. 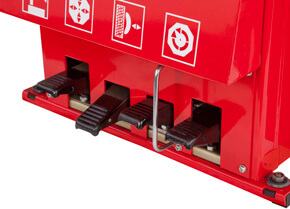 The NextGen tyre machine foot pedal control valves feature multi-link rod connections for non-binding plunger movement and precise bilateral control. 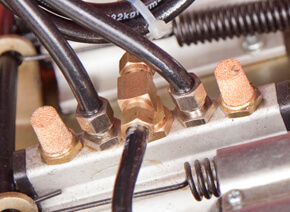 All NextGen main-lead electrical terminals, auxiliary switches, and motor enclosures are sealed for air-tight, dust-free and contamination-proof protection of terminal leads. 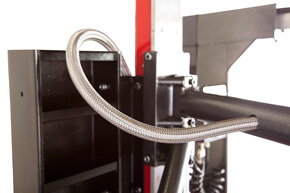 High-pressure polyurethane pneumatic tubing with mirror smooth seamless bore for exceptional flow rates, high abrasion resistance, high burst tolerance and maximum kink resistance come standard on every Ranger NextGen tire changer. Specially engineered drive-belt features convex sidewalls to distribute component wear evenly while providing proper belt support for improved service life NextGen tire changer. 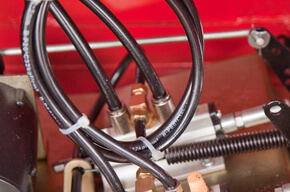 Flex-bonded cords resist the effects of oil, heat, ozone, weather and aging. 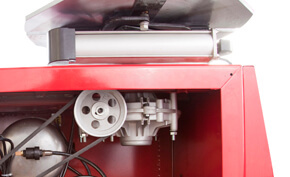 Internal baffles and a constant seating stress flange gasket assure positive, leak-free venting on every NextGen tire machines. The rugged gearbox enclosure is precision milled for precise alignment of horizontal and vertical bases and features precision helical gears that operate much more smoothly and quietly than typical spur gear transmissions. 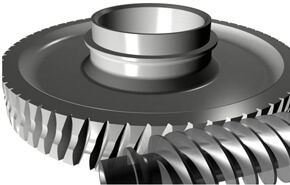 High-strength, oversized worm and worm gears are straddle mounted between heavy-duty tapered roller bearings providing rugged dependability for your NextGen tire changer. The rugged NextGen housing provides maximum strength for extreme durability under hard working conditions and greater precision under load during worm and gear alignment. 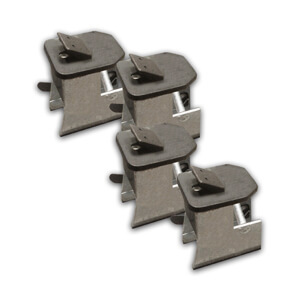 Durable, hardened, alloy-steel RimGuard wheel clamps features internal and external multi-teeth jaws with vertical mounting bolts that make replacement fast and simple on your NextGen tire changer. 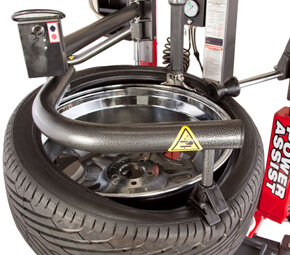 R23AT, R26AT, R26DT and RX3040 NextGen tire changer models feature a powerful assist tower with a multi-profile traveling drop-center tool that holds stubborn sidewalls in the drop-center area of the wheel for swift, precise mounting. 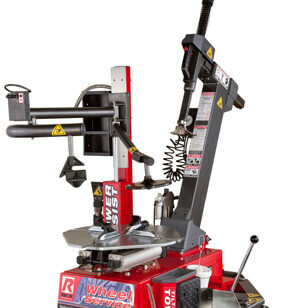 R23AT, R26AT, and R26DT NextGen tire changer models feature a powerful assist tower with tri-flange, cast-iron carriage with linear way bearings for durable maintenance-free operation. 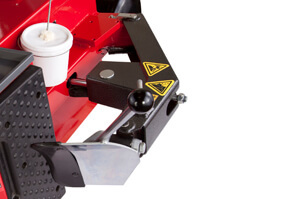 R23AT, R26AT, and R26DT NextGen tire changer models feature a single lower bead lifting disc that can be used to unseat stubborn lower beads or to elevate tires for tool placement. 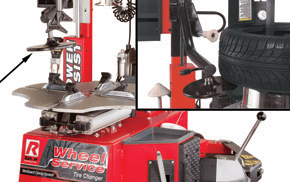 A tire iron slot disc located on the NextGen tire changer's power assist towers gives operators additional leverage for difficult tire handling. Up front trigger control and articulating arm allows for variable tire and wheel configurations on R23AT, R26AT, and R26DT NextGen tire changer models. 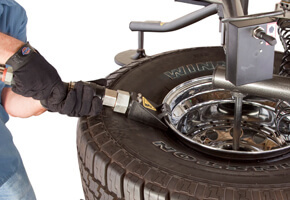 A pneumatic nylon non-marring wheel restraint device on R23AT, R26AT, and R26DT NextGen tire changer models assures wheels are safely secured to the turntable during inflation procedures. 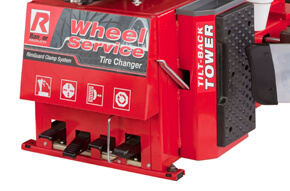 NextGen tilt-back tire changer models feature a tilting tower design that provides greater clearance and access for tire removal and inflation. 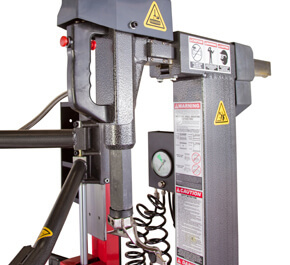 Pneumatic-lock tool head stays positioned on the tower return for instant set up for like sets of tires and wheels. Stainless-steel and aluminum pneumatic cylinders are designed to reduce NextGen tyre machine vibration and provide low-friction and long life operation. 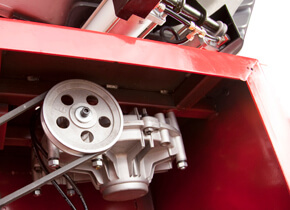 Internal end-of-stroke cushions are standard that help provide cushioning at the end of each full stroke to reduce wear on seals, wear band and piston rod. 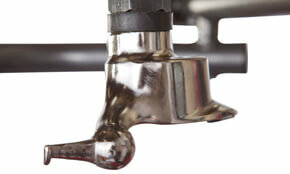 Permanent lubrication design provides outstanding service life for your NextGen tire changer. 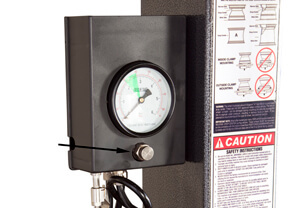 A hardened alloy steel mount and demount head has a unique equidimensional shape that allows you to perform all tire changing functions with the tool head in the same position. 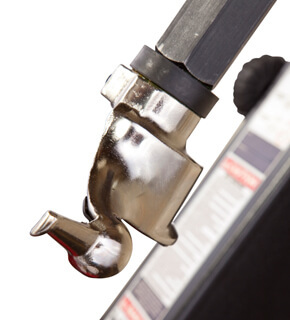 The micro-smooth tool head surface glides tire beads effortlessly during mounting and demounting procedures to ensure costly tire damage is minimized with your NextGen tire changer. 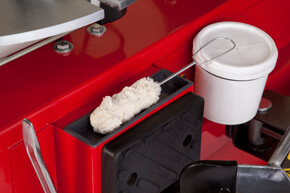 Every NextGen tire changer comes standard with a large soap bucket and brush. 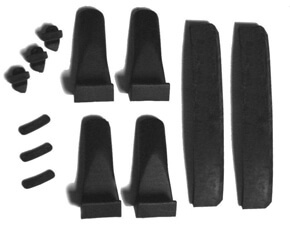 A multi-piece plastic wheel protector kit comes standard with every NextGen tire changer. Includes turntable jaw covers, bead-breaker blade boots and specialized mount / demount head covers to help protect delicate wheels. 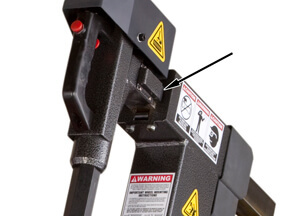 Hardened steel tire iron and bead lever tool to assist during all tire mounting and demounting operations. Rigid 45mm spring assist hexagonal vertical tool shaft and hardened-steel horizontal outrigger support arm maintains perfect position of the mount-demount tool head during all tire changing and service procedures. All moving parts feature maintenance-free linear guide bearings for easy adjustment of both vertical and horizontal wheel settings. 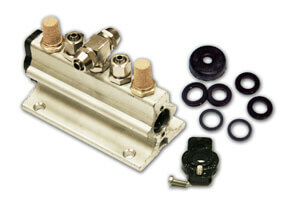 A hardened lower roller guide provides smooth and controlled in and out movement. 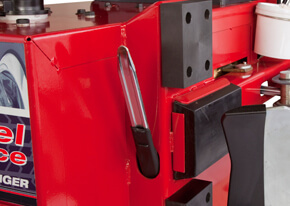 Integrated rubber bump stops assure smooth return during tilt-back tire changing operations to help reduce shock loading and minimize wear on tower guides and moving parts. 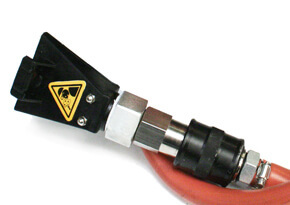 A simple to use tire inflator features foot-pedal operation and inflation hose with a sure-grip clip-on valve chuck enabling hands-free tire changing operations. 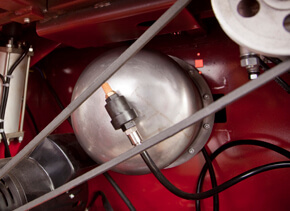 Integrated air pressure dump valve enables you to lower tire pressure with a simple push of a button on the NextGen tyre changer. A welded-steel, eight-gallon surge tank is larger than competitive models for all the inflation power you need, when you need it. 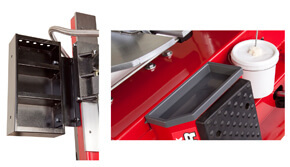 All NextGen tire machines feature plenty of storage area for tools and accessories. Helps keep your shop tidy and operation-critical tools close at hand. 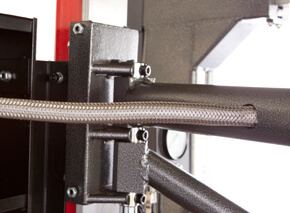 Stainless steel braided metal conduit protects hoses and wires from abrasion and wear on NextGen tire changers. 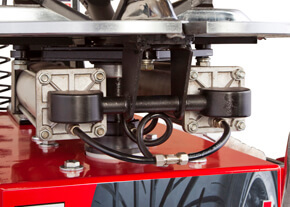 Optional motorcycle turntable clamps add a whole extra level of versatility to your NextGen tire changer. Expand your capabilities, clientele and your bottom line. Heavy steel construction, anodized finish and quick-release, spring-loaded locking pin keeps clamps secured safely to table. Comes in a set of four. 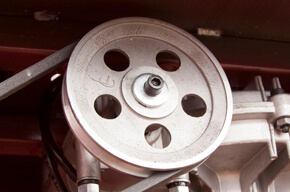 Optional reduction clamps reduce the wheel clamping capacity 4” and are perfect for smaller diameter motorcycle and ATV wheels and tires. 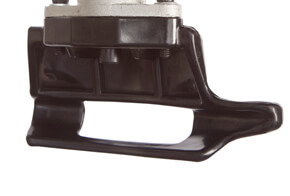 NextGen motorcycle clamps are constructed out of heavy steel, feature an anodized finish and a quick-release, spring-loaded locking pin that keeps clamps secured safely to the changer's table. Comes in a set of four. Optional plastic mount-demount head helps protect expensive alloy wheels from marring or damage during tyre changing operations. 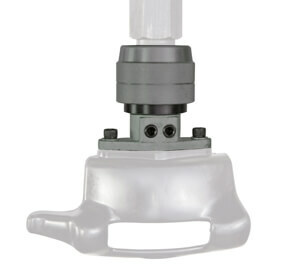 Optional quick-change kit speeds up mount-demount tool head changes on your NextGen tire changer.